The aim of satellite-tracking is to map the habitat use of breeding pairs and learn more about the predator-prey interactions in order to prepare more efficient conservation measures for the species involved. In addition, tracking provides important information about the threats, as the recent case shows. Carcass found (Photo: Matyas Prommer). 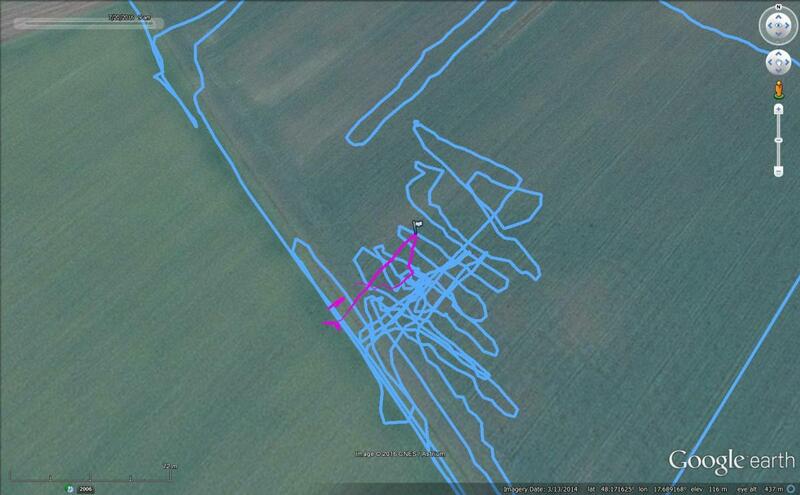 The unfortunate bird received the small, high-tech GPS-GSM-UHF device without external antenna this spring. The male falcon had been ringed as a chick in 2014 in a nest near Lake Balaton. He started breeding with his pair this year, however the breeding failed, because the female disappeared from the eyrie for unknown reason. We assume that she perished. After that, the male visited Slovakia several times looking for good feeding possibilities. 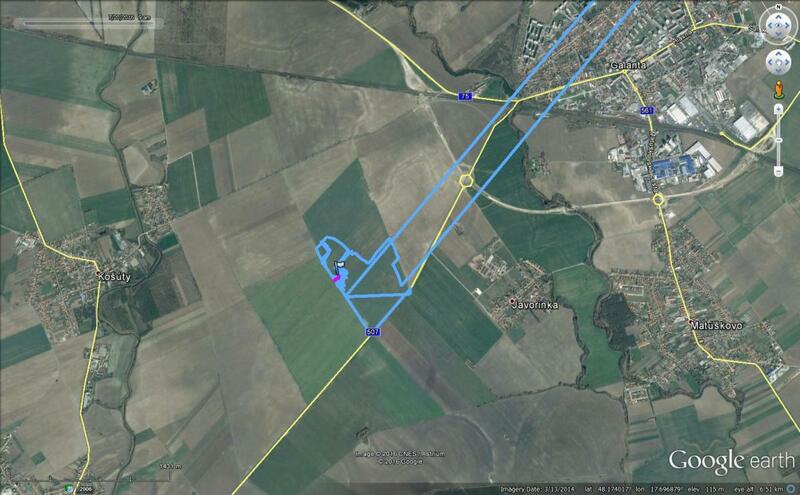 On the 13th July, it became likely from the signals of the transmitter that the bird got into trouble. 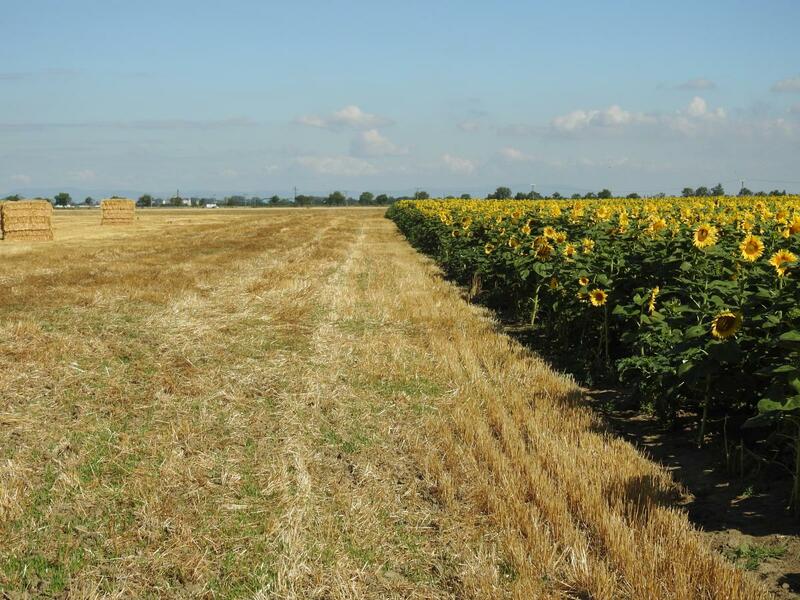 A colleague of Raptor Protection of Slovakia (DRAVCE) visited the site – a large sunflower field - within short time, but he did not find the bird despite that he searched the site thoroughly. Maybe the bird was still alive that time and he moved away when seeing someone approaching. On 20 July, the Imperial Eagle conservation “HELICON” LIFE project came to our help on our request. Gábor Deák and his dog, "Falco", visited the site. "Falco" had been especially trained for such type of search in the frame of the project. 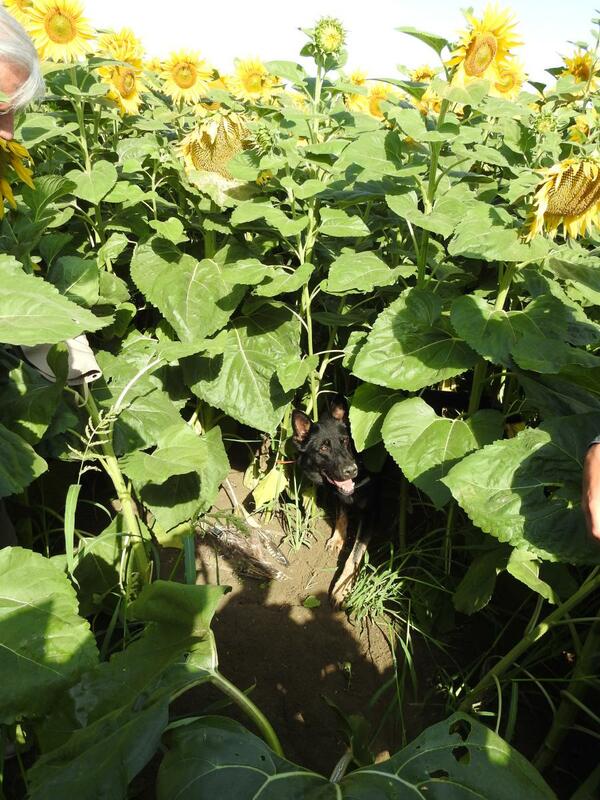 The dog found the carcass of the falcon in the dense sunflower field within ten minutes. 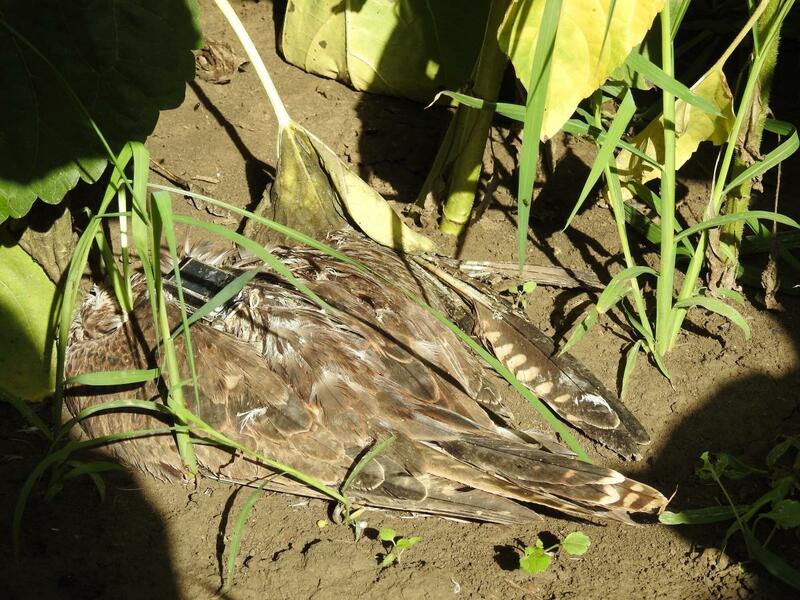 Looking at the carcass, it became clear from the wounds immediately that the bird was killed by the 22 kV power line crossing the sunflower field. Based on the signals of the transmitter and the distance from the nearest pole (260 m), it is likely that the bird lived for a few days after the electrocution, but he could not fly anymore. The power line section in question is crossing a pilot site of DRAVCE's LIFE project focusing on conservation problems caused by power lines. The power line poles on the site had been already monitored a few times, however, no electrocuted bird was found so far. A possible explanation is that most of the raptors – Kestrels, Common Buzzards – still present in the area arrived probably after harvesting the wheat field right next to the sunflower field. It also means that the power line poses threat only in certain time of the year and it depends also on the actual agricultural plants. Sign of electrocution (Photo: Matyas Prommer). 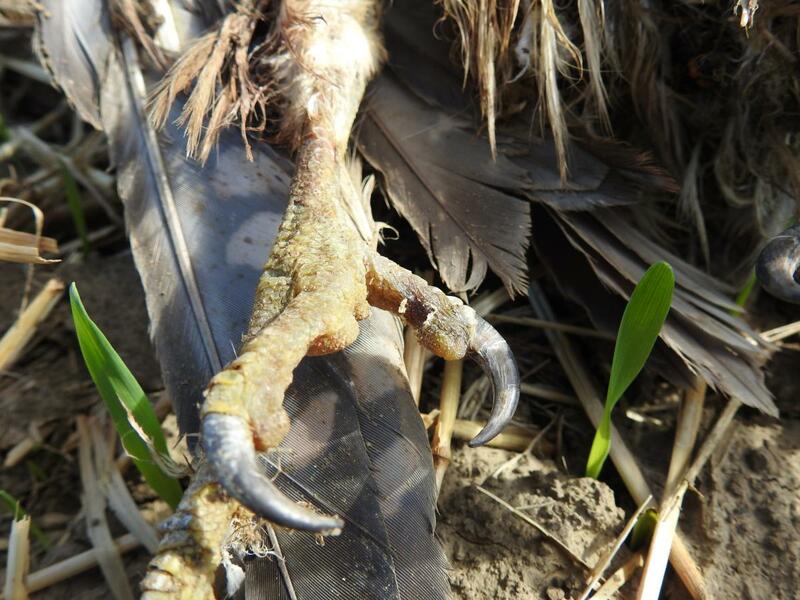 Recently, the Hungarian Bird Ringing Centre has records of 21 electrocuted Sakers ringed in Hungary and most of them were found dead. 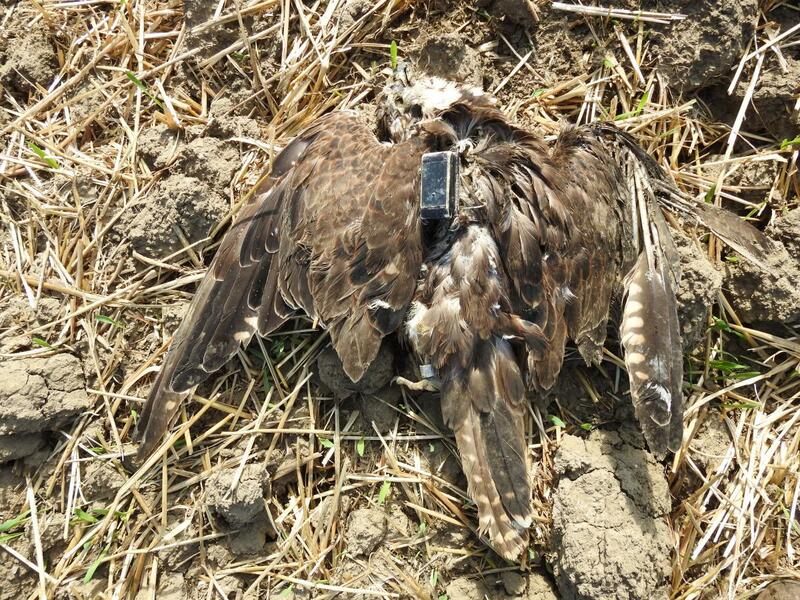 In addition, according to the data base of the MME/BirdLife Hungary's Monitoring Centre another eighteen electrocuted Saker Falcons without rings were found during the standard targeted surveys along the mid-voltage power lines. The falcon with the transmitter (Photo: Matyas Prommer). The recent case proves that although efforts have been made to cease the problem of electrocution, it is still a high risk factor for birds. The ultimate solution could be a broad international co-operation – maybe an EU regulation – that oblige electricity suppliers and governments to replace dangerous poles within a limited time period. search with dog). The pole can bee seen in the upper right part of the map. In addition, it became clear again that search is much more efficient with a dog, thus using dog units can strongly contribute to mapping certain conservation problems (electrocution, poisoning) and to their solutions. Map of the area showing the location of the carcass and the track logs.